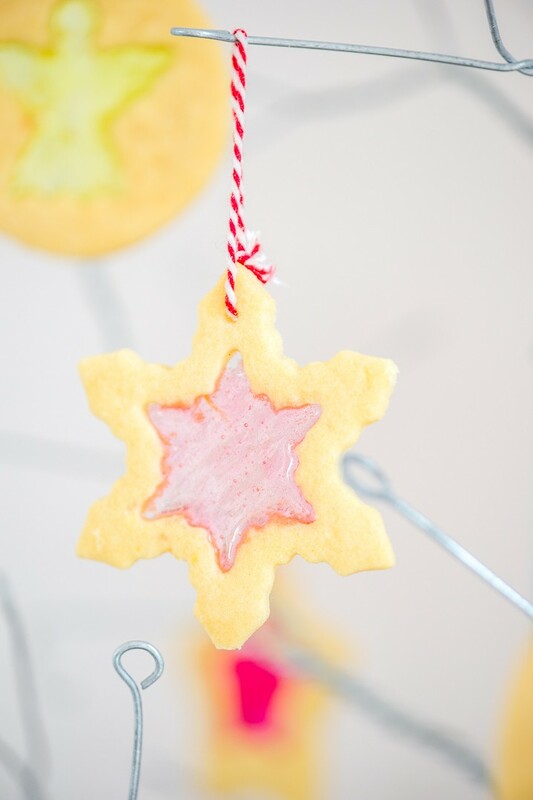 ‘Tis the season to be jolly, so brighten up your tree with some pretty Stained Glass Cookies! These are simply delicious buttery biscuits with a crisp candy centre. Beautifully eye-catching and tasty too. It is quite amazing to see how the crushed sweets melt into a beautifully clear “window” inside the cookie. The cut out shape can be anything you choose – these are certainly not reserved for Christmas time only! I found adorable mini gingerbread men, snowmen, angels and snowflake cutters at various baking stores. Hearts and stars work well too! Cream together the butter and castor sugar until light and creamy. Add the egg yolk, vanilla and salt, and mix well. Gradually add the flour and mix just until the dough comes together. Divide the dough into 2 flat discs and wrap in cling film. Refrigerate for 1 hour. In the meantime, separate the sweets by colour. Place each colour into a ziplock bag and crush finely with a rolling pin (or use a mortar and pestle). Roll out one of the discs of dough between 2 pieces of floured baking paper to about 2mm thick. 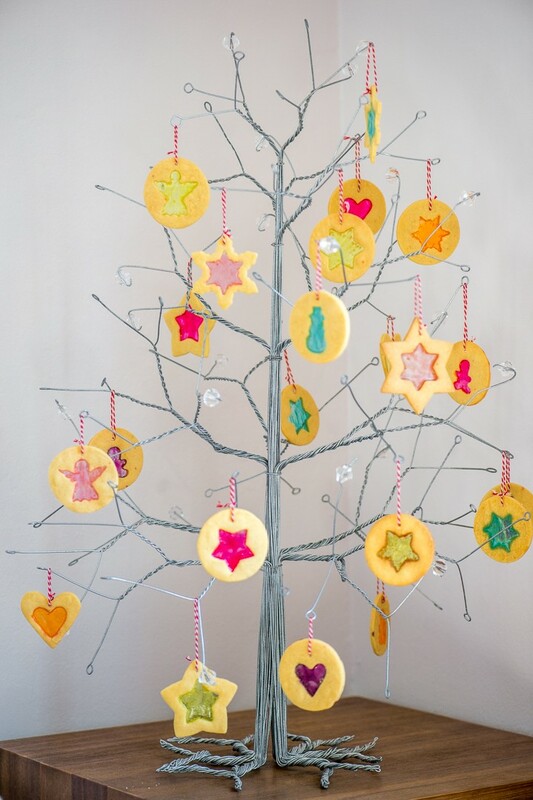 Cut out rounds, then cut out the centre of each using cookie cutters of your choice. Alternatively cut out large stars/hearts then small stars/hearts from each centre. (You can either bake the cut-out bits separately or re-roll them with the rest of the dough). Place the cookies onto the lined baking tray and refrigerate for 15 minutes. 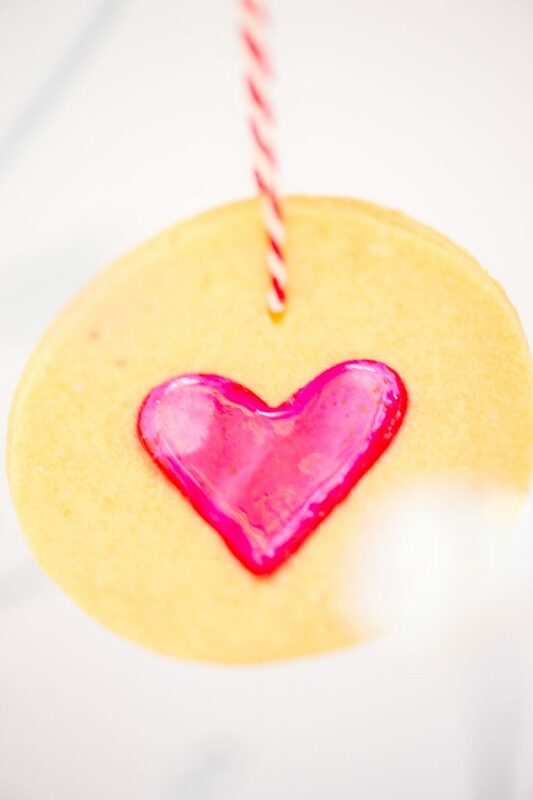 Use a teaspoon to fill each cookie centre with the crushed sweets. Brush any excess bits off the dough with a pastry brush. Use a toothpick to make a small hole at the top of each cookie. Bake for 10 – 12 minutes, or until all the candy has melted and the cookies are just turning golden. Watch them closely as the candy centre will bubble up and burn if left too long. Allow the cookies to cool for 5 minutes on the tray, then remove and cool completely on a wire cooking rack. Repeat this process until all the dough has been used. Once the cookies have cooled completely, thread some twine through the hole at the top and tie a small loop for hanging on your Christmas tree. The cookies can be stored in and airtight container for about 5 days. Humidity will cause the cookies to go soft and the sweets to go sticky!